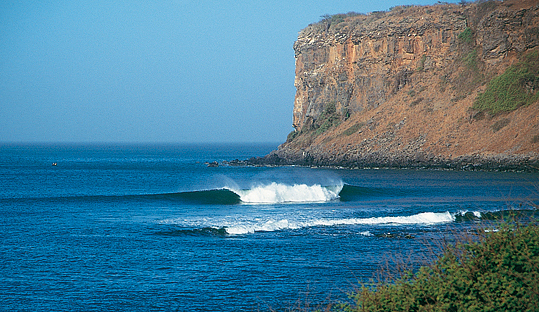 Most surfers who visit Senegal head straight to the prime surf area on the Almadies Peninsula, just outside Dakar. This westernmost tip of Africa juts out into the ocean and the peninsula has one of the largest swell windows in the world. Swells can appear from the SE all the way around to the NNE, which is about 260°! Another great thing about this zone is that most of the spots lie within easy walking distance of each other. The winter NW swells can be powerful, reaching 8-10ft, and Senegal also receives consistent S/SW 3-6ft swells from May-October. Long distance southern hemi swells can sneak 1-4ft waves through a narrow window. The Harmattan (N-NE) trade winds blow from Nov to April becoming more NW from March to June. Sometimes the wind starts blowing before dawn and then calms down around noon. The short wet season typically has W-SW winds. Tidal range is never over 2m, but it can affect shallow spots. It’s dry most of the time, except from late July to early October. The water temp drops below 18°C (64ºF) in the heart of the winter and combined with the wind chill, a 3/2mm is needed from Dec until May. Boardshorts from Aug-Oct.
Dakar is a big city with markets, shops and nightlife. Take the boat ride to the former slave island of Goré. Local surfers hang out at Secret Spot, below the Diarama hotel. Sharks are rumoured to patrol the coastline, but fish are plentiful! Your main enemies are the sea urchins. Malaria and Yellow Fever are not major threats. Your biggest hassle will be street hustlers, eager to sell you things. Senegal is a very French destination. The Tribal Surf Shop at Le Virage has a good range of SAF boards and bodyboards. They also have a good board repair service. Locals use the south end of N’gor beach as a toilet.